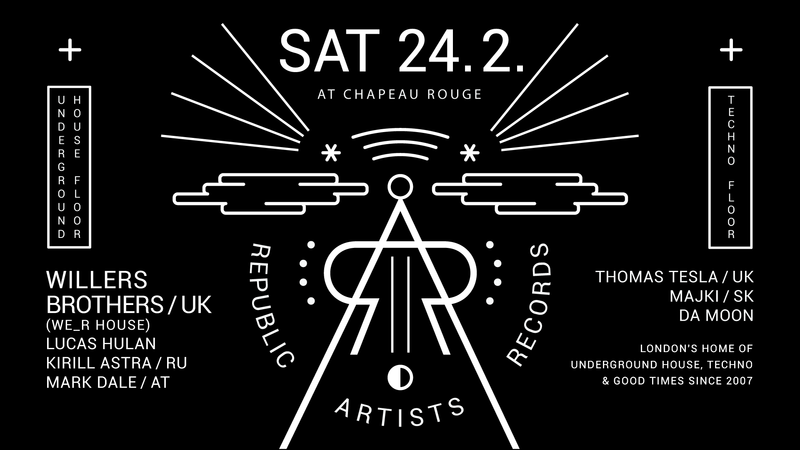 London’s home of underground house, techno & good times is back Chapeau Rouge Prague. This time with The Willers Brothers. Join the troops partisans. underground house click over the past few years. Drum & Bass, it was just a natural progression into house music which happened around 2011. After breaking in to the London’s club scene at a very early stage in there career, they managed to hold down a residency at one of the cities best known nightclubs EGG LDN. They held this down for 4 years before making the move to Germanys capital. With a string of releases on labels such as Beste Freunde, EWAX, nofitstate, they started their own imprint WE_R HOUSE with Berlin resident and house head Cinthie. The first WE_R HOUSE release dropped late 2017 with 4 tracks from the boys which got the attention and support from artists such as Enzo Siragusa, East End Dubs, Ferro, Fabe and many more, whilst also hitting the number 1 spot on Decks records buzz and bestsellers charts. such as Watergate, IPSE, Tresor, Pacha Barcelona, Space Ibiza , Zoo Project Ibiza, Propaganda club Moscow to name a few. firmly in the underground scene. They have a lot more to come and are here to stay.